Effective March 1st, 2017 there were two major changes which affected books sellers. First, sellers are now able to set their own shipping price, even offer free shipping, while previously they were hardcoded to use $3.99. Second, fees for products sold increased, and are now calculated including the shipping price. Previously the fees were $1.35 per item, plus 15% of the item price. Now the fees are $1.80 per item, plus 15% of the total sales price (item price + shipping price). To understand how this affected the market we looked at total feedback received by books sellers on both Amazon and eBay and how it changed over time. Feedback is not a direct representation of sales volume, but its fluctuation over time does match sales volume change. 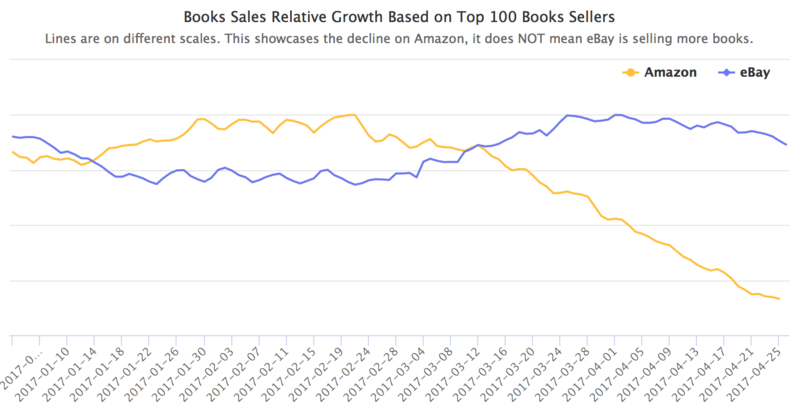 *This showcases the decline on Amazon and growth on eBay, it does not mean eBay is selling more books than Amazon. The two lines in the chart are on different scales. After the March 1st fee change we saw a big slow down on Amazon, as much as 25 percent. While at exactly the same time on eBay we saw an increase by close to 15 percent. The percentage numbers are rough estimates so they shouldn’t be used for anything critical, but they do showcase how this fee changed the market. This mostly affected sellers selling low price books, commonly known as penny books. Before many books were sold at $0.01 plus $3.99 for shipping, but since March the price had to increase to offset the rise in fees. Many of these books are now priced at $6.00 or more, a $2.00 increase. While a small increase in terms of dollar value, the increased price was noticed by customers who went looking elsewhere for better deals, bought Kindle books, or picked a new book from Amazon instead. Many books sellers are not using Fulfillment by Amazon (FBA), especially the large sellers with millions of books listed. Managing such a large quantity of heavy items on FBA is prohibitively expensive and risky. Thus many sellers fulfill their own orders. It used to be more profitable for penny books to be shipped using FBA, but over time Amazon has increased the fees, and the risk of not selling a book and thus paying storage fees is high. When Amazon launched the Amazon.com marketplace in November, 2000 it was still mostly selling books. It wasn’t until 2003-2006 when more categories got added like toys, jewelry, electronics, etc. So the marketplace was created for books sellers as a way to drastically expand the catalog. But since then Amazon’s focus has shifted towards other categories. In our recent article Un-Amazon-Able Is the Only Way to Compete with Amazon we wrote that e-commerce businesses need to realize opportunities Amazon is not fit for. We think used and penny books have over time became one, creating opportunities for eBay and other marketplaces to capitalize on this.